MEPs from the Greens/EFA Group in the European Parliament also say there is still no "cooling off period" for ex-parliamentarians to move to private sector jobs which they used to regulate, arguing that they should have "the right to work". A European Commission ethics panel cleared former president Barroso, after he accepted a job with Goldman Sachs only 20 months after leaving office. Officials said Barroso did not break any rules when he accepted the role of non-executive chairman at the US investment bank. 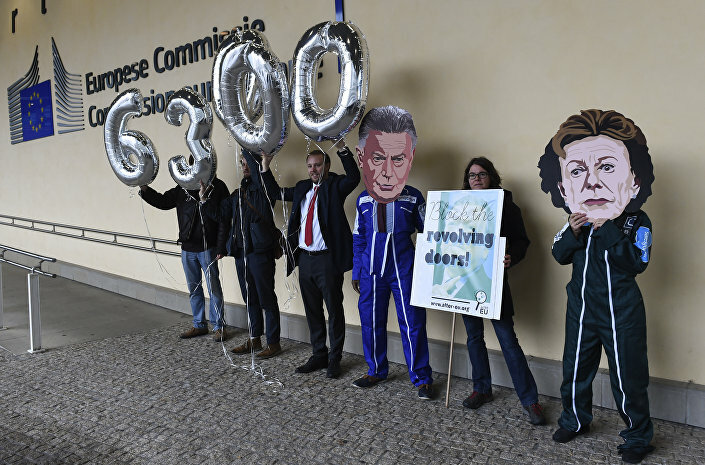 Members of international NGO Transparency International hold balloons reading "63,000", indicating the number of signatures on a petition against Jose Manuel Barosso's decision to work for Goldman Sachs, during a demonstration at the EU Headquarters in Brussels on October 12, 2016. The Greens/EFA politicians say efforts to reform the Ethical Advisory Committee to give it "meaningful powers" to ensure that sanctions are imposed on MEPs that don't comply with the ethics rules have been rejected by the larger political groups. In a statement, the MEPs said: "They only wanted to change the current wording slightly so that the European Parliament President 'shall' — instead of 'may' — instruct the ethics committee to look into a case. "And, because of their resistance, it is still only the EP President that has the power to impose sanctions, with no transparency or other mechanisms in place in case the President has not followed the advice of the Advisory committee," they said. The MEPs say lawmakers are currently free to engage in various different roles in the private sector, which raises questions about potential conflicts of interest, particularly when MEPs — who are elected to defend the general interest — are also engaged in lobbying activities that lead them to act on behalf of private interests. Despite the fact that some MEPs argued that restrictions on their outside employment would be a "violation" of their fundamental rights, members of the European Parliament's Legal Affairs Committee have voted to amend their Rules of Procedure, to secure a ban on paid professional lobbying directly linked to the Union decision-making process. However, the Green Alliance say this means that providing advice to others on how to lobby is still allowed. There have been calls for a cooling off period to be placed on former MEPs who move into the private sector to work for industries they were previously tasked with regulating. However, the Greens alliance say that — because of due "blockage by other groups, who claim that MEPs should have 'the right to work' — the only change that was made was that ex-MEPs should now inform the European Parliament of their new jobs if they plan to work as lobbyists".